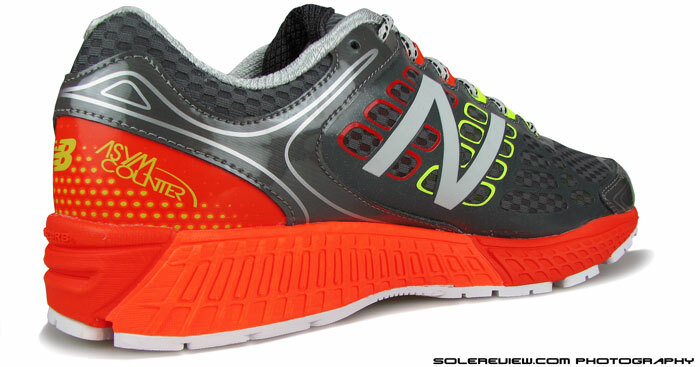 New Balance's marketing pitch: Delivers premium stability and superb cushioning without sacrificing style. Upper: Engineered mesh, stitched and no-sew synthetic. Midsole: Compression molded EVA foam, firmer medial post, N2 rubber insert. 8 mm heel-to-toe offset. Outsole: Soft blown rubber under the forefoot, harder Carbon rubber under the heel. If a cushioned shoe with a medial post is what you seek, then the 1260V6 fits the bill. It has a padded ride, and minus the overbearing motion-control behavior which can accompany a medial-posted running shoe. Do a quick sweep of New Balance’s assortment, and you get this nagging feeling that the brand in the throes of an identity crisis. It is almost if someone took a knife and carved the brand’s product selection into two distinct halves: Fresh Foam, and non-Fresh Foam. It all began with the somewhat underwhelming Fresh Foam 980. The 980 left the legacy design language for a minimal form-factor made of single density midsoles and no-sew uppers. Over time, the Fresh Foam series discontinued the numeric suffix altogether. Today, we see a raft of Fresh Foam models in different shapes and sizes, like the Boracay, Zante/Pace/Prism/Rush/Coast and its ilk. 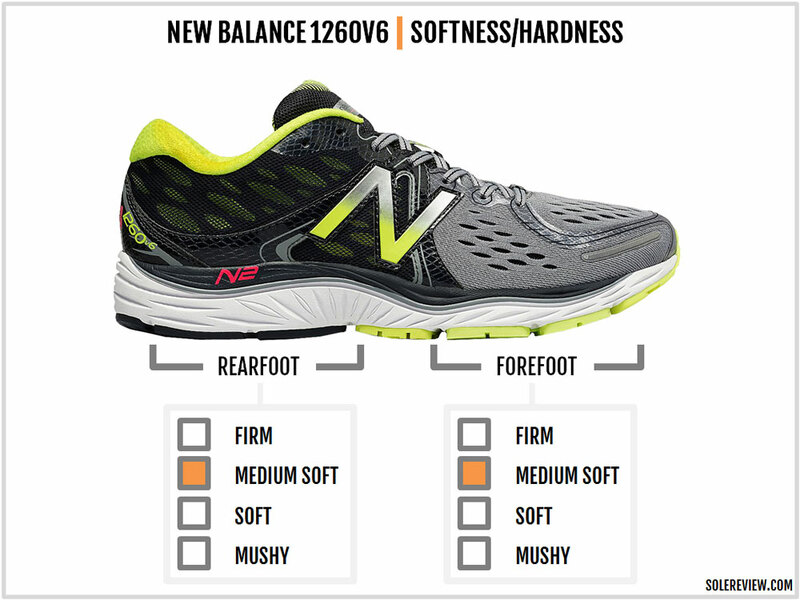 Some of these are great shoes with sufficient differentiation in ride and fit quality. On the flip side, New Balance’s minimal design initiative is nearing saturation and appears to be drowning in a sea of sameness. There’s only so much a low or high heel offset midsole can do. Considering that the Fresh Foam material isn’t special at all, one begins to wonder what New Balance’s product tiering strategy is. What’s more bewildering is that New Balance is unable to make up its mind when it comes to the rest of its numeric, non-Fresh Foam models. On the one hand, models like the 1080 V6 have hopped over to the Fresh Foam design template, but retains their numeric (1080) identity. Then you see the 1260V6 with a traditional build. This is at odds with the 1080’s evolution, considering that the 1080 V7 is supposedly a neutral version of the 1260. 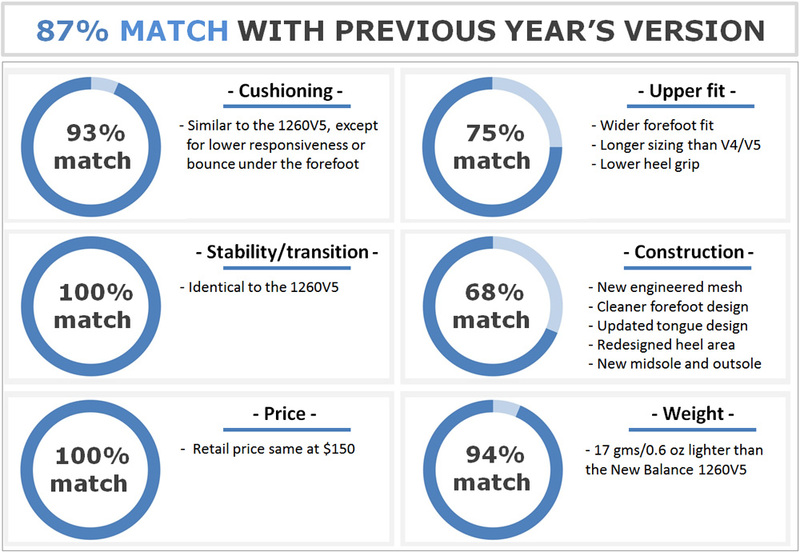 So if the Fresh Foam format is the bus which everyone’s jumping on, then why isn’t the 1260 V6 on it? There are product overlaps too. New Balance sells the 1500 as well as the Vazee Prism (both are lightweight support shoes), so what’s the conceptual difference here? 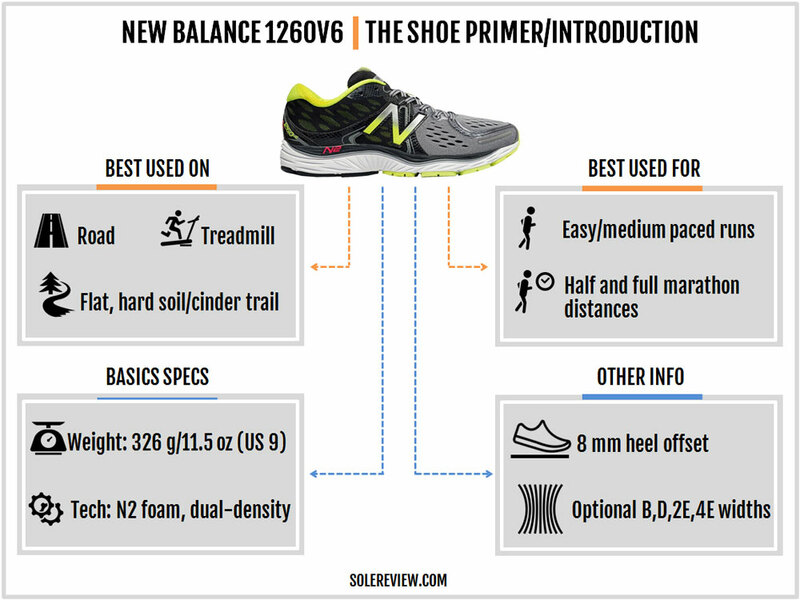 If you’ve run in both shoes, you know that the 1500 and the Prism are indeed different, but what of first-time buyers? That is some foam for thought. Anyway. 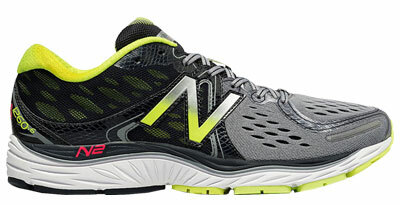 For now, what you need to know is that the 1260 V6 is based on the legacy New Balance design. Which means that you’ll get a midsole with a medial post, plastic shank, and the N2 rubber cushioning inserts. The upper sticks to a traditional design too, cobbling together a mesh and synthetic leather skeleton with a no-sleeve tongue. The 1260 has changed a lot over the past three years, and we’ll walk you through all the updates today, be it cosmetic and functional. 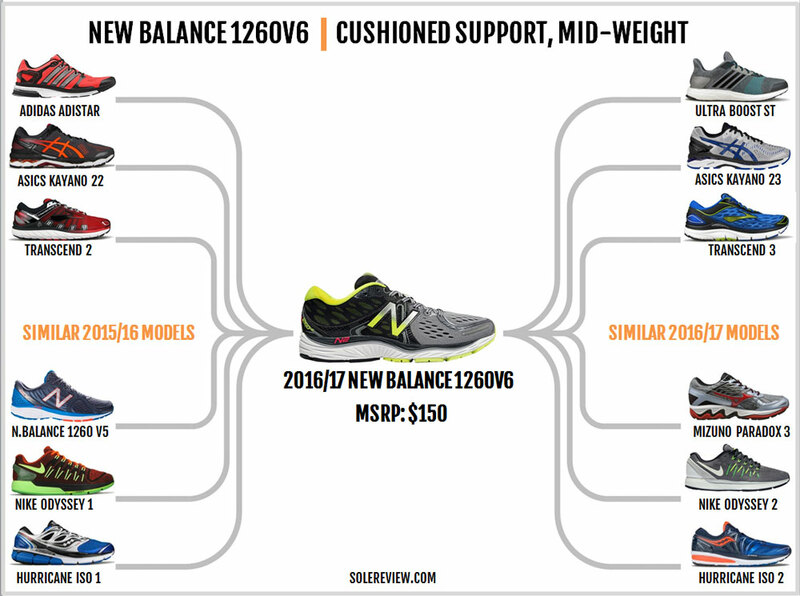 The 1260V6 is New Balance’s flagship stability model, which is loosely translated as an expensive, well-cushioned shoe with a medial post. This is a shoe for runners who are drawn to a medially-posted (the firm wedge) midsole but like more cushioning on the side. Most brands have their ideal of a cushioned stability shoe. adidas has the Ultra Boost ST, and Asics markets the Gel-equipped Kayano 23. The Transcend 3, Paradox 3, the Odyssey 2 and the Hurricane represents Brooks, Mizuno, Nike, and Saucony respectively. The common theme which cuts across all these models is an undisguised attempt to pack in as much cushioning material as possible while keeping up the stability appearances. Even so, some models are softer than the others. Among these, the adidas Ultra Boost ST is the softest, following by the Kayano 23 and yours truly – the 1260. The next rung of softness is claimed by the Transcend 3, the Paradox and the Odyssey. And not all of these shoes have firm medial-side wedges. The Ultra Boost ST does not have one, and nor do the Transcend or the Paradox. These models either use a variation of their cushioned tech (Wave) or a broader midsole (Ultra, Transcend) as a support feature. So which of these are similar to the 1260V6 in ride quality? We’d say it’s the Hurricane ISO, and the Kayano 23 comes a close second. The Hurricane is firmer than the 1260V6, while the Kayano 23 is marginally softer. Naturally, both fit differently than the 1260. The Hurricane and the Kayano fit narrower in the forefoot (vs. the 1260), while offering a better heel grip than the 1260. Even though the 1260 hasn’t crossed over to the Fresh Foam side yet, the model hasn’t been without its period of changes. Both the upper and sole design have undergone a slew of updates in the past three years, affecting the 1260’s fit and ride manners in the process. The upper design has a lot of changes coming from the V5, and is a distant place away from the V4. One aspect which immediately stands out is the much cleaner forefoot and toe-box design of the 1260V6. The 1260V5 had a lot of synthetic overlays over the forefoot and toe-box. This year’s 1260 frees the front of clutter and moves some of the layering to the mid and rearfoot instead. Most of the forefoot is now made using an engineered mesh, a textile which has a bit of stretch – something which the V4 and V5’s mesh did not. 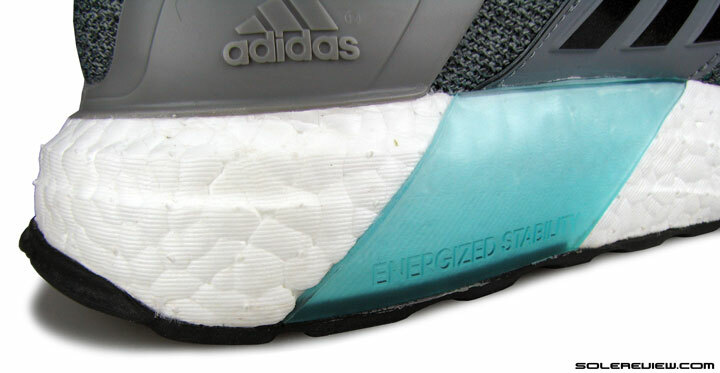 A small reflective strip is fused over the inner toe-box. There are supportive layers in the shape of welded strips over the mesh, but their usage has been limited to a bare minimum. 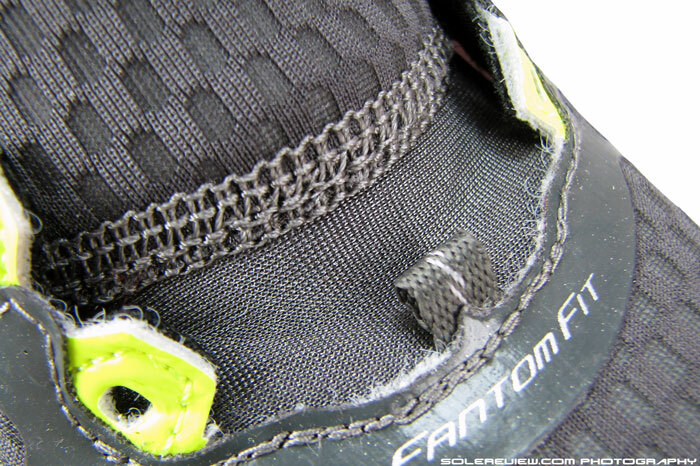 And instead of a synthetic leather bumper (of the V5), the V6’s toe-box has an internal stiffener. This gives the 1260’s toe-box a more sloped profile than the V4 and the V5. The mid and rearfoot has plenty of structure and cosmetic detailing. The stitched-on synthetic components have a glossy, faux-reptilian hide texture, and there are teardrop-shaped patterns below the mesh. By the way, this ties in aesthetically with the teardrop-shaped molding of the midsole. The collar edges have been kept free from synthetic leather, which is different from the how the V5 was designed. As a result, the V6’s heel collar edges have a softer feel to them. 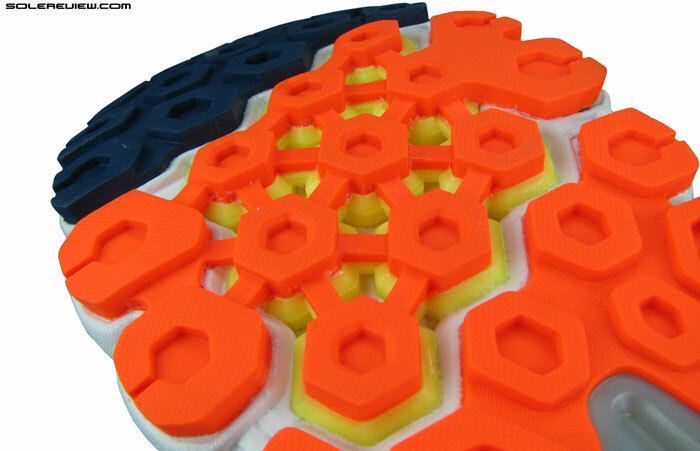 Inside, the heel lining has a soft-hand feel and is abundantly quilted with foam. As seen on the previous versions of the 1260 (the 1080V5 too), the heel has an internal counter. 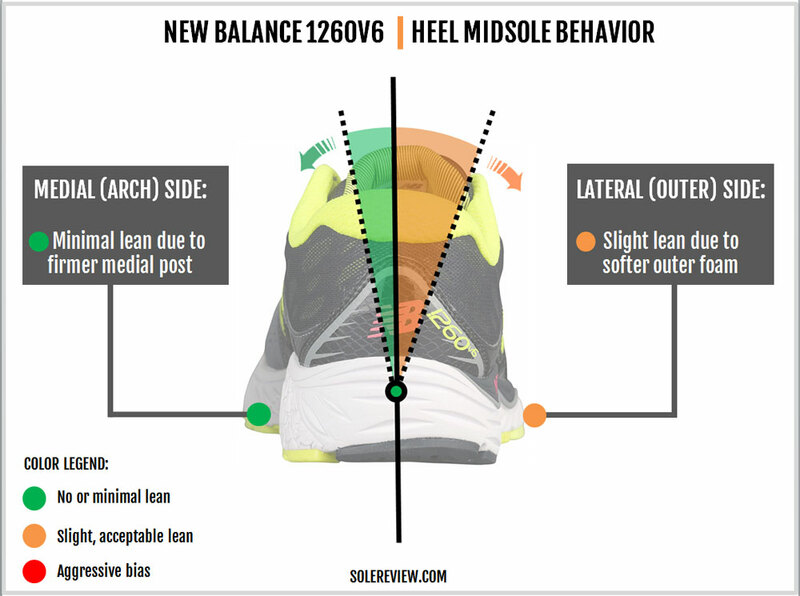 New Balance calls this the ‘Async’ heel, which basically means that the inner/arch side is taller than the lateral/outer side. Hence the name ‘Async,’ which is an abbreviation of the word asynchronized. While the tongue still retains the sleeve-free construction, there’s a change you should know about. The tongue on both the 1260 V4 and V5 had an elastic gusset in the front, which meant that you could stretch the tongue over your foot. The 1260V6’s plump tongue uses an engineered mesh instead of the elastic, so the elastic effect experienced on the V4 and V5 is greatly reduced. The lack of the elastic gusset isn’t a good or bad thing, but runners switching from the V4 and V5 will notice a slight difference in the fit character. As with all no-sleeve tongues, the 1260V6 has a mild case of tongue slide. There’s a loop over it for the laces to pass through, but that isn’t very efficient in stopping sideways slide. By the way, if you’re wondering if the new 1260V6 is made in USA like the V4 was, then the answer is no. 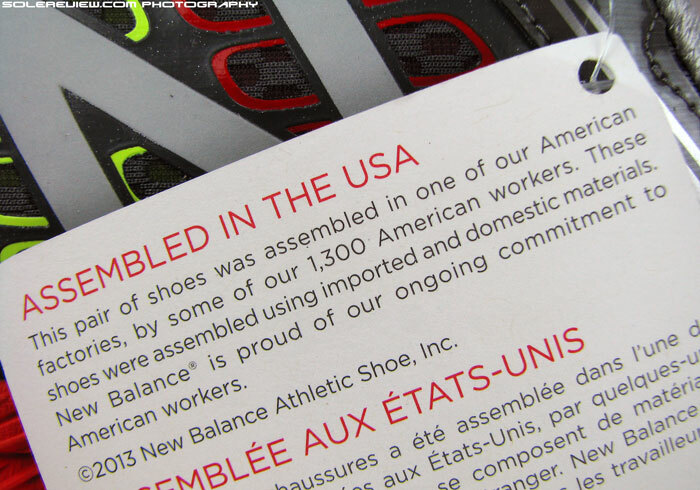 Even though the V4’s production was split between the US and Asia, we haven’t come across an instance of a made-in-USA New Balance 1260v6. Keeping in line with the upper changes, the 1260’s midsole and outsole design receive its share of updates. Before discussing the V6, let’s recap what happened last year. The 2015 1260 V5 had significant changes over the V4. On the 1260V5, the medial-post construction changed to a more gradual one, and the forefoot got a dose of New Balance’s N2 Burst cushioning material – something which the v4 lacked. 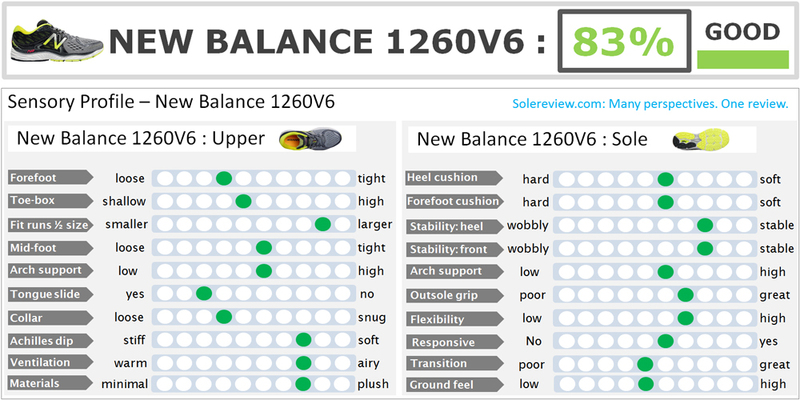 Incidentally, the 1260 V5’s forefoot design was a straight lift from the 1080V5’s N2 design. The 1260V5 also introduced a redesigned medial-post. Instead of starting abruptly near the heel and covering the entire rear and midfoot, the V5’s medial post had a gentle, sloped design. The medial post rises gradually from the heel and ends in a similar forward slope. The 1260V6 carries forward the V5’s sole fundamentals while adding its design spin. The inner midsole has a crescent-shaped firm wedge similar to the V5, and the outsole comes with a few updates. 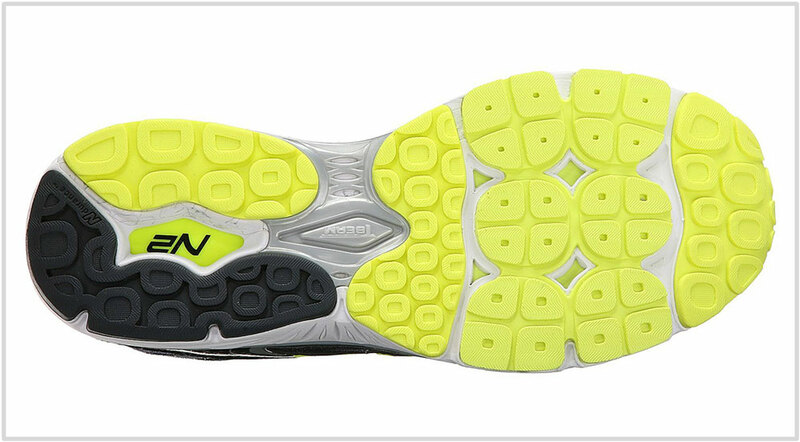 N2 Burst is used under the forefoot, but the blown rubber outsole lugs are not directly mounted on it. There’s a layer of midsole foam between the Lime-colored N2 Burst and the outsole, affecting the ride quality in the process. Regardless, the 1260 retains its excellent forefoot flexibility. 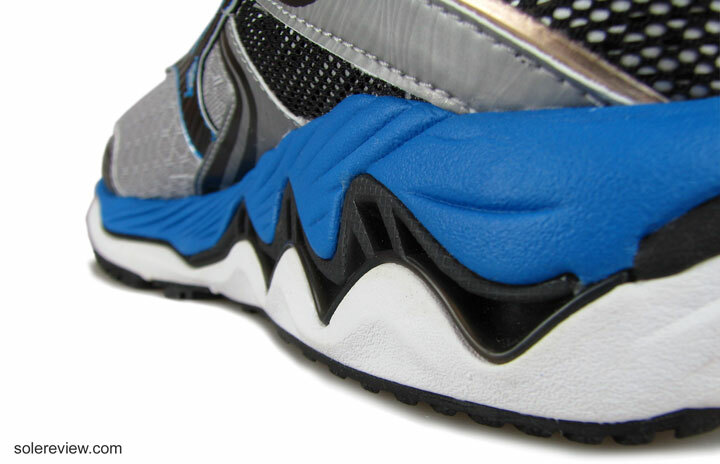 The front of the outsole is blown rubber, and the rearfoot uses a harder compound. That sameness aside, the outsole geometry gets an update. The lugs are larger on the V6, and the heel outsole does not get the deep flex grooves seen on the V5. Whereas the V4 and V5 covered both sides of the plastic shank with outsole rubber, the V6’s T-Beam plastic bridge is partially exposed on the inner side. 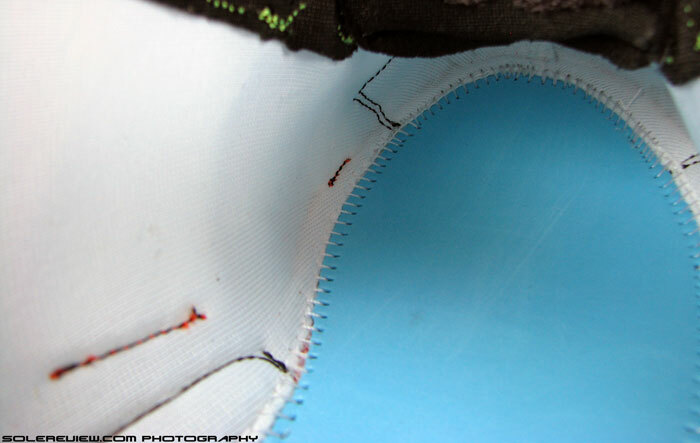 Under the heel, the 1260v6 has a cavity with the green N2 material showing through – just as the V4 and V5 did. On a related note, the lower priced 860 V7 (the 1260’s watered-down version) shares the same outsole schematics, though made with less posh materials. A couple of components are carried over from the previous versions without any change. 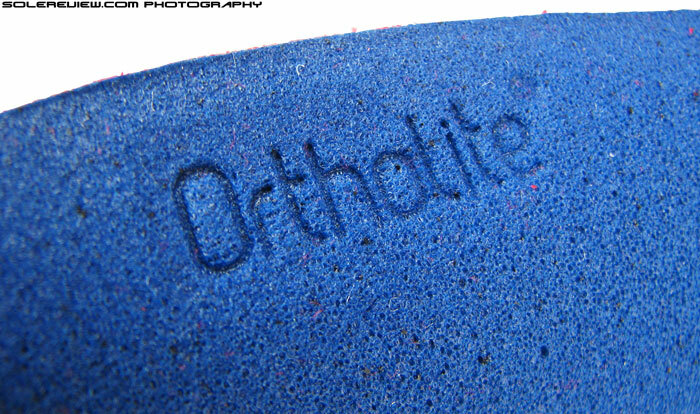 The anti-microbial insole is supplied by Ortholite, and it is made of the same soft blown foam. It has a sizable heft and acts as the first layer of softness under the foot. The lasting below it is made of EVA foam, exactly like the V4 and V5. All the components on the 1260V6 are robustly assembled. The traditionally design upper utilizes multiple layers of materials, leading to a build quality which feels sturdy and long-lasting. This build quality makes the premature failure of parts unlikely, and the 1260V6’s upper will probably outlive the outsole. The outsole is covered with copious amounts of rubber. The forefoot uses a softer blown rubber, so expect to see some initial shredding before the rate of wear tapers off. The midsole foam is EVA, no matter what New Balance chooses to name it. So it will, like any other EVA foam, be susceptible to vagaries of time. After a few hundred miles, the midsole will undergo a gradual loss of its cushioning properties. The 1260V6 replaces the stitched bumper of the V5 with an internal one, and that leads to a tapered front profile. Although the toe-box isn’t shallow based on the industry average, it is relatively shallower than both the V4 and V5. Runners who are used to the V4 and V5’s elastic gusset might feel the V6’s tongue to be slightly shorter, but there is no cause for worry. The V6’s tongue’s length is more than sufficient, and its foam plumpness filters lacing pressure well. The heel wraps around the foot with predictable softness. The lining used is a soft type, and there’s a lot of foam padding. Even so, the V6’s level of heel grip isn’t as confidence inspiring as the V4 and V5. Two factors come into play here. The first factor is the heel molding itself. When viewed from the top, you’ll notice that the V4 and V5’s heel were molded narrower than the V6. Also, there aren’t synthetic layers near the upper heel, which also allows the V6 to splay wide. The second factor is located not in the heel area, but in the forefoot. The V6’s forefoot has a much wider fit than the V5 and V6, impacting the heel fit. In the next section, we’ll explain why. With most of the synthetic layering gone, the V6’s forefoot gets increased room for foot splay. Our guess is that the last hasn’t changed, and only the choice of material – stretch engineered mesh in this case – influences the fit outcome. If you compare the V4, V5, and the V6 side by side, you’ll quickly realize that the except for the thin synthetic, the V6’s forefoot sides are free of any layering. This aspect, when combined with the newly introduced engineered mesh, allows a greater range of movement – which in real-world terms, translates into a wider fit. 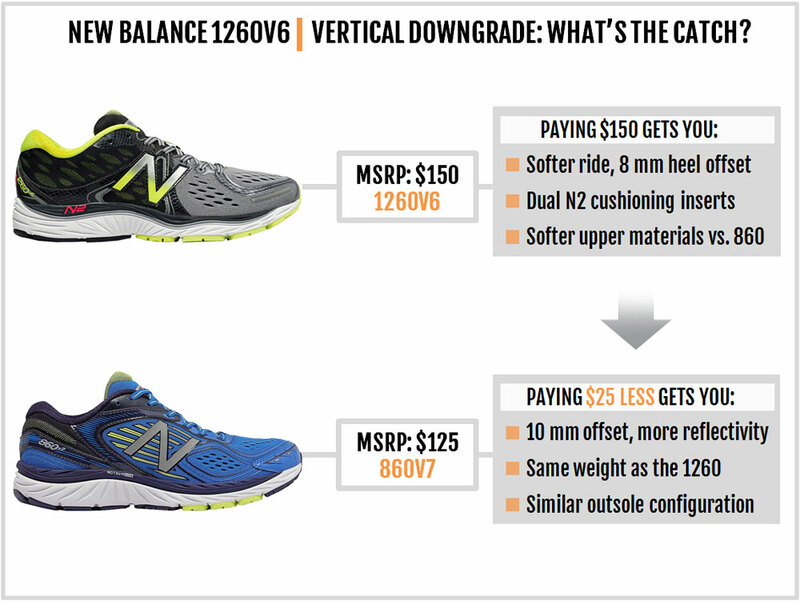 As pointed out, the heel design plays a significant role in the 1260V6’s sizing. Notwithstanding the slightly sloped toe-box, the 1260V6 is a half-size larger than the V5. This is on account of both the heel and the forefoot design, which allows the foot to be positioned slightly rearwards over the shoe. 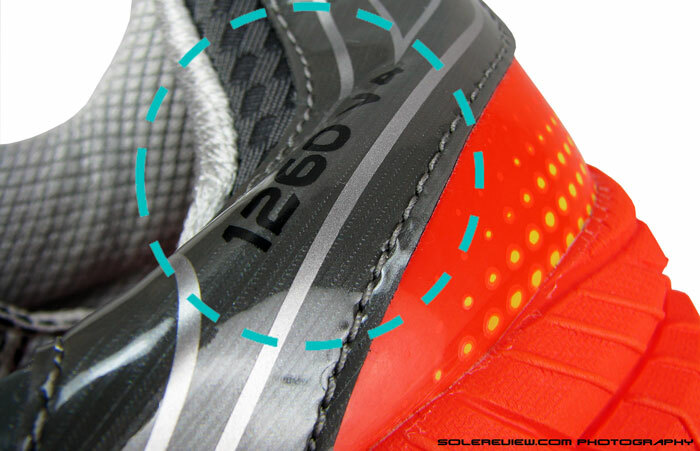 The 1260V6’s forefoot is better ventilated, as the larger pores on the engineered mesh allow better air circulation. The 1260 has long been one of those stability shoes which feels cushioned as well as supportive. The thick midsole adds to the padded experience, and so does the chunky Ortholite insole. 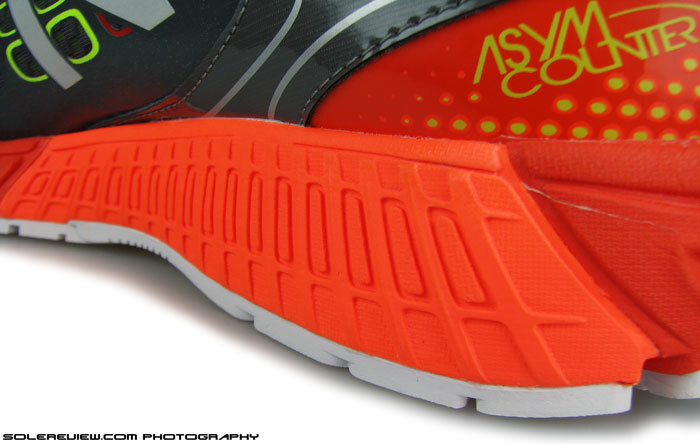 Also aiding the cushioning experience are the blown rubber forefoot and the heel cavity. There’s practically nothing between the N2 heel insert and the ground, so each step causes the cavity to compress and produce ride softness. The inner side has a medial post, but remember, the design is very gradual. The sloped medial post does not come right up to the midsole edge like the 1260V4 did, so there’s no sense of poking hardness near the edges. The level of cushioning makes the 1260 suitable for long and easy runs, and as well as non-running activities such as standing all day or walking around. 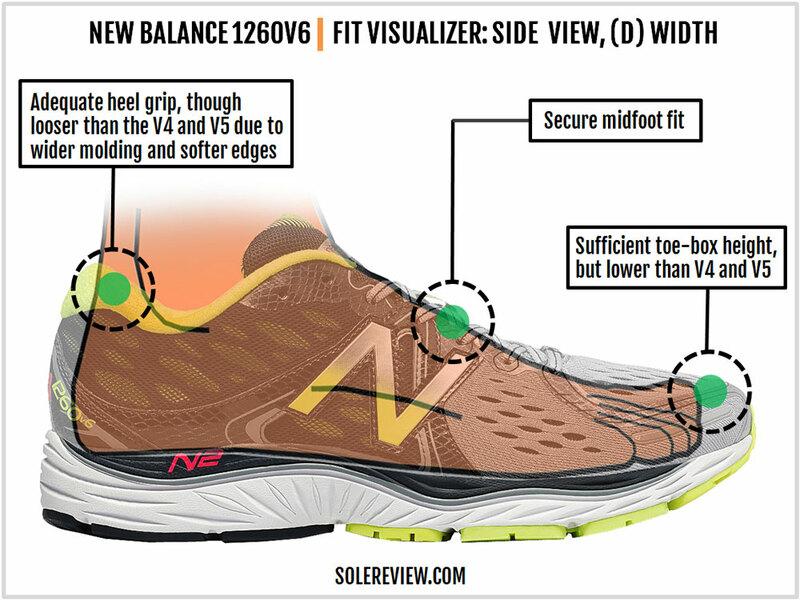 The N2 heel cavity and the N2 Burst forefoot makes the 1260V6 mildly responsive. N2 is the fancy name for a rubber-like compound placed above the midsole foam, and this delivers a slight rebound experience. Under the heel, the N2 material acts as a trampoline of sorts, and the resulting sensation is somewhat responsive. 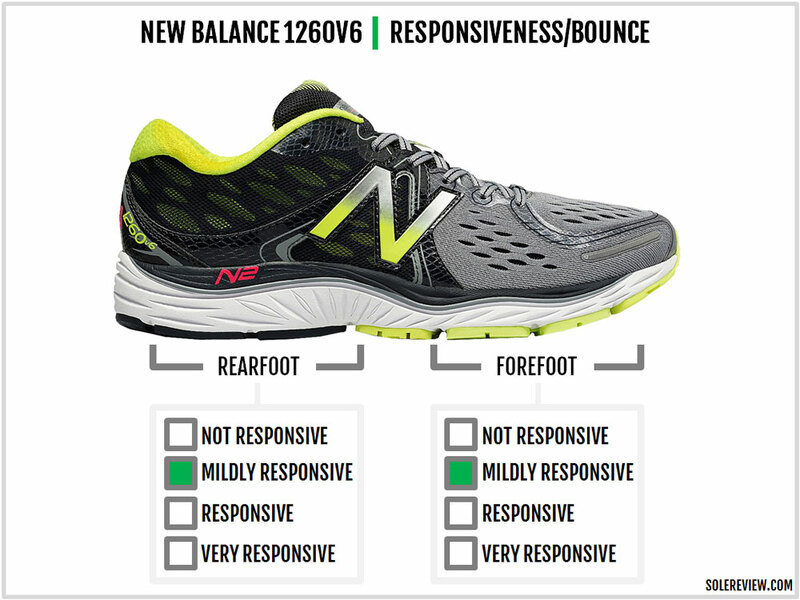 The forefoot has N2 as well, but its revised placement affects the levels of responsiveness. 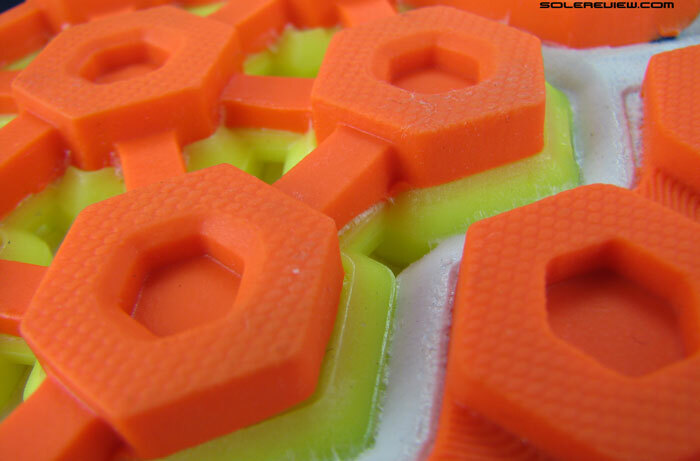 Unlike the 1260 V5, the V6’s outsole is mounted over the midsole foam and not directly attached to the N2 material. 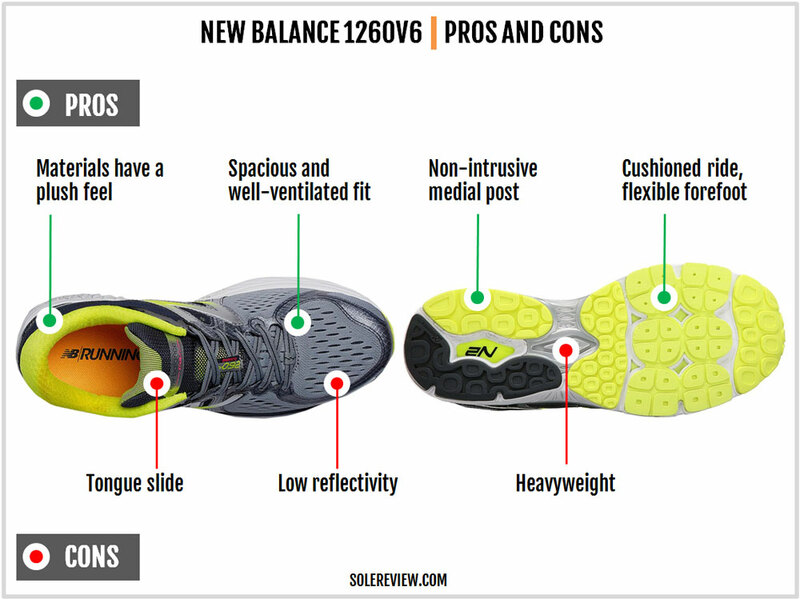 This reduces the forefoot responsiveness when compared to the V5. The 1080 V5 was another example of how the forefoot rubber was in direct contact with the N2 material underneath. To summarize things, the 1260 exhibits a mild spring-like ride quality, and the forefoot’s responsiveness is lower compared to the 1260 V5. There’s plenty of stability on the 1260. 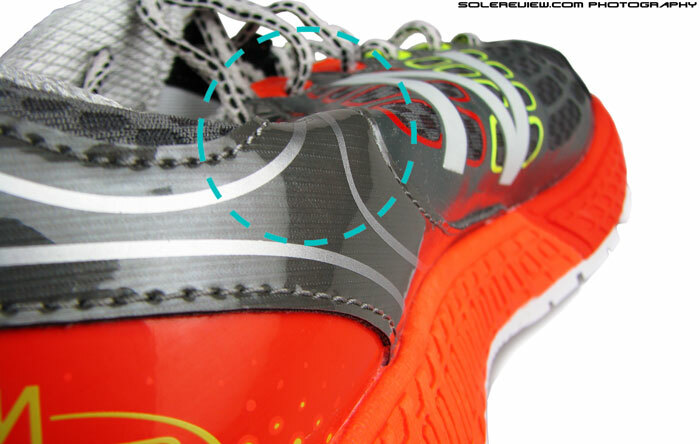 The broad forefoot results in a planted ride, and the heel cavity keeps the foot centered. The 1260V6 also has exceptional torsional rigidity, thanks to the large plastic shank. Despite the firm medial-post, the 1260 does not have an excessive motion control behavior. The midsole has lots of cushioning, but far from overly soft. This makes either side of the midsole well balanced, except for a slight outwards biased lean which is acceptable. The 1260 is not a ‘fast’ shoe. The heel cavity design brings about a rearfoot-biased cushioning, an aspect which leads to leisurely transitions. We don’t recommend lacing up the 1260 for speed workouts or race-days; there are other products (see our rotation section) better suited for the job. 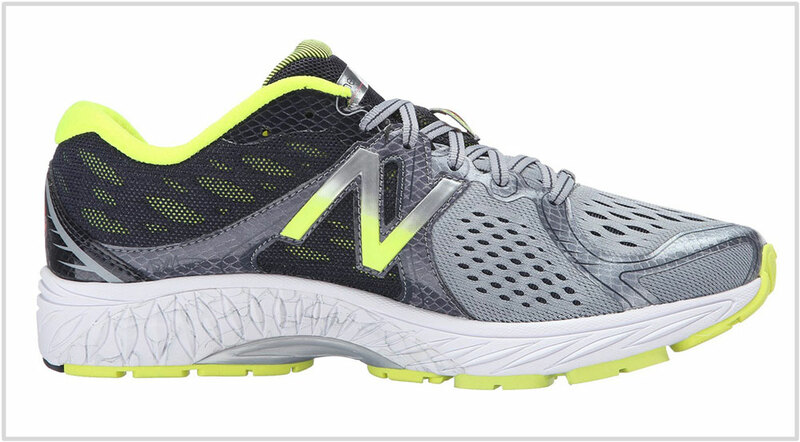 With its non-intrusive medial post design, the New Balance 1260V6 will appeal to a lot of runners who’re looking for a cushioned, yet supportive shoe. The 1260 is proof that support need not come at the cost of cushioning. The material-rich midsole produces a cushioned ride, while the subdued medial-post provides support without getting in your face. It’s a comfortable, spaciously fitting shoe for long runs, and everything on the 1260 is well put together. Also, the outsole grips well, and the engineered mesh helps keep the interiors cool. The 1260V6 is by no means a light shoe. At 326 grams or 11.5 ounces (US 9), it is one of heavier shoes in the market. That’s the trade-off for all the material you see and experience on the 1260. So if you’re looking for a lightweight shoe, then you’ll do well to scratch the 1260V6 off your list. There are few other glitches on the 1260. The heel fit isn’t great, the tongue has the tendency to slide, and there’s an alarmingly low amount of reflectivity for a $150 shoe. The sizing is also inconsistent with prior 1260 versions, and that could throw you off. In a general sense, none of these issues are absolute deal breakers. 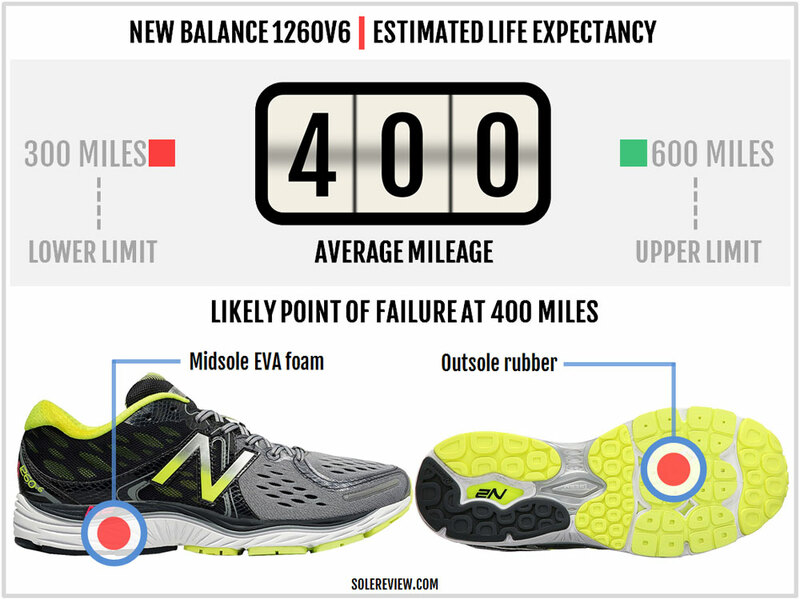 But given that running shoes are so personal in nature, you’d need to weigh the benefits of the 1260 over its shortcomings to assess whether the sum of parts makes sense. We’re assuming that you’d like to stick to shoe with a medial-post, or at least a variation of it. In that case, the slightly cheaper and lighter Fresh Foam Vongo is the shoe for a differentiated and supportive ride experience. We feel that the similarly priced (to the Vongo) 860 V7 is redundant, as it weighs close to the 1260. And in case you feel the need to speed dial, then either the Vazee Prism or the 1500 V2 (now V3) are the go-to shoes. When mixing up shoe brands, have a look at the Nike Air Zoom Span, a shoe which we recently reviewed. It’s cushioned, lightweight, and yet supportive enough. Like the 1260 V6, it has a spacious forefoot fit. The adidas adizero Tempo 8 Boost is purpose-built for faster workouts, and it will serve you well as a speed-shoe rotation. You must have realized by now that the 1260V6 comes boxed with multiple updates. The biggest update concerns the shoe’s fit, which is now wider around the forefoot and longer in overall size. The engineered stretch mesh creates an abundance of space, and when combined with the heel and toe-bumper redesign, makes the V6 a half size longer than the V5. The heel also goes down a notch in grip levels. 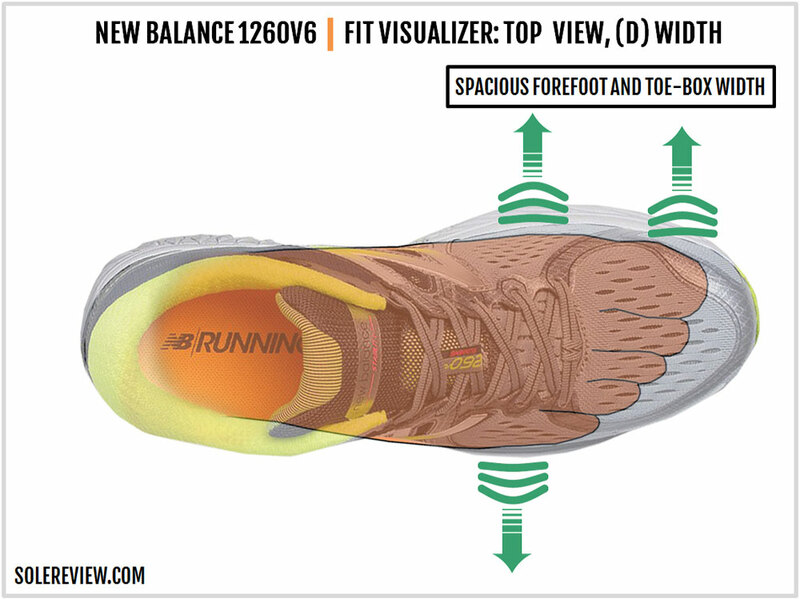 Because of the outsole update, the forefoot cushioning has a decreased rebound feel than the 1260 V5. There are some other structural tweaks, such as the tongue without the elastic section, and a softer Achilles area. Trimming the amount of synthetic leads to weight savings. The 1260V6 is 0.6 ounces or 17 grams lighter than the identically priced 1260V5. At an MSRP of $125, the New Balance 860V7 is the watered-down version of the 1260 from a features and materials perspective. It weighs the same as the 1260, except that it does not have the N2 insert under the midsole. The 860 V7 has a slightly higher static heel offset of 10 mm, and features a medial-post (like the 1260, only smaller) over the inner midsole. The upper has a lot of detailing, like the engineered forefoot mesh and the high-density printing over it. The bottomline is, if you’re looking for a supportive and cushioned shoe, and can do without the additional responsiveness of the 1260’s N2 material, then consider the $25 cheaper 860. 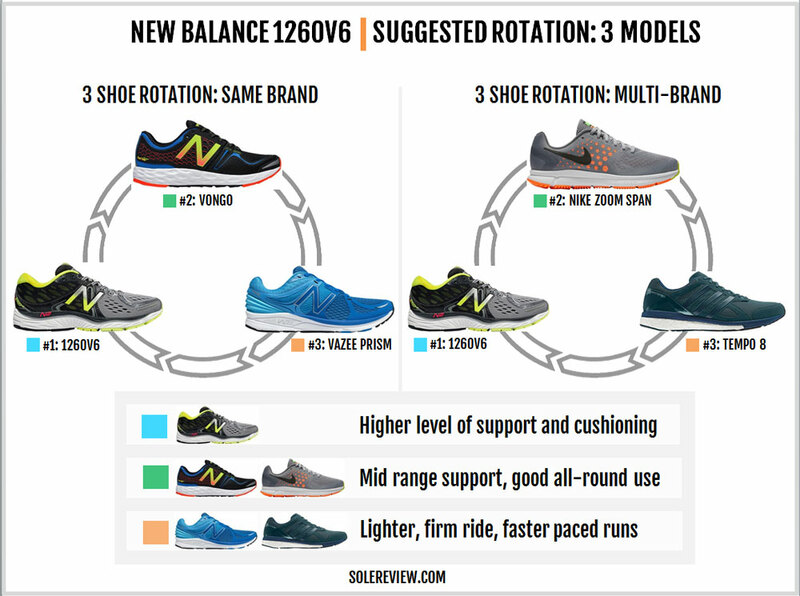 If a lighter support model with a faster feel is what you’re after, our three-shoe rotation section lays out different options for you.